Ben Robinson|GoBuccs.com Covington High School senior Lauren Christian signed her letter of intent to be on the women’s track team at Oakland (Michigan) University. In front with Christian are her mom Jennifer Christian and grandfather Jan Christian. 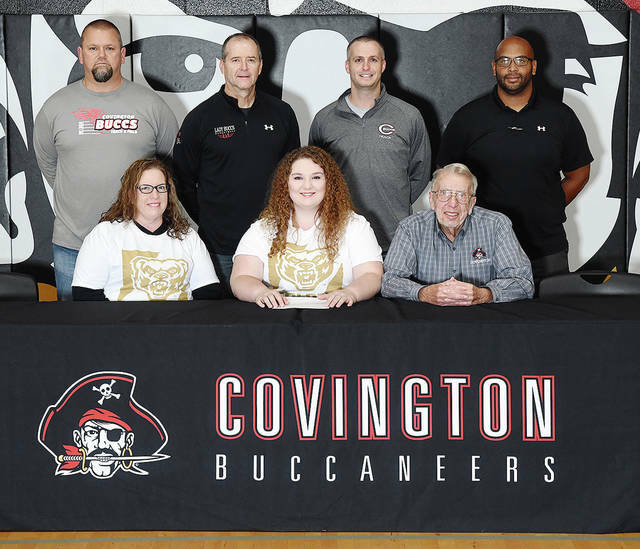 COVINGTON — Lauren Christian has always had high aspirations for herself as a thrower at Covington High School and after completing her senior season in the spring of 2019, Christian will take her talents to the state of Michigan after being rewarded with an athletic scholarship at Oakland University. For Lauren’s mother, Jennifer Christian, it was a proud moment to witness her daughter make a commitment for the next phase of her education. Which is having the same type of success at the collegiate level as what she’s been able to achieve in high school. With her senior season of high school still ahead of her, Christian has already established herself as the top female thrower in Covington history as she owns the school record in the shot put (44-1 1-2) and the discus (123-7). She is also a three-time state placer as she took third at state in the shot put and seventh in the discus this past spring and finished sixth at state in the shot put as a sophomore in 2017. And Christian credits those who have supported her to this point in her journey. Another individual who has helped Christian in her journey lives outside of the Covington community, Theo Whitaker. It has all led to a great high school career with another season yet to come and an opportunity to compete at the Division I collegiate level. And fortunately for Lauren’s family and friends, they will be able to watch her compete. Oakland is part of the Horizon League, so even if family and friends can’t make the trek to Michigan, Christian will compete against schools closer to home. Until then, Christian is excited about her senior season of high school. https://www.dailycall.com/wp-content/uploads/sites/30/2018/11/web1_lauren-christian.jpgBen Robinson|GoBuccs.com Covington High School senior Lauren Christian signed her letter of intent to be on the women’s track team at Oakland (Michigan) University. In front with Christian are her mom Jennifer Christian and grandfather Jan Christian.